You can just hear him saying "That's a baaaad idea." I’m always amazed that Irish rental car agreements put no restrictions on where you can take their vehicles; like yesterday’s adventure. 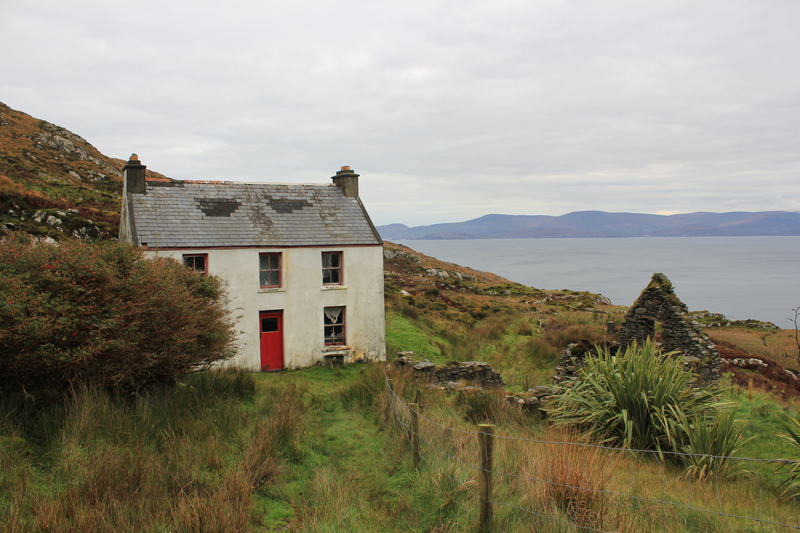 Several months ago, while browsing Irish real estate online (one of my hobbies) I found a quaint “fixer upper” on the Beara peninsula. It’s been the desktop photo on my computer since then, and I thought, why not try to find it. I showed it to John Sullivan, my innkeeper, who of course knew where it was. He also said it was the house used in the 1998 BBC movie, “Falling for a Dancer.” Bonus! I had seen the movie and thought the house looked familiar. 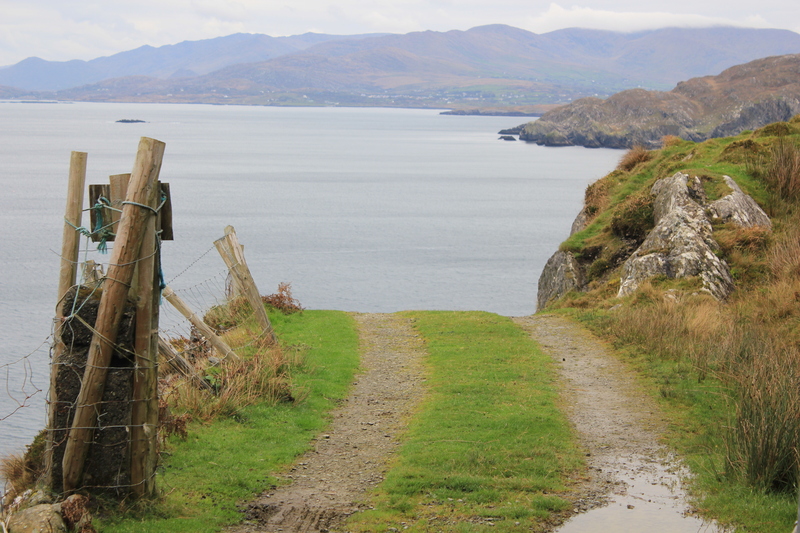 "Fixer upper" on Cod's Head peninsula, Beara peninsula, County Cork. 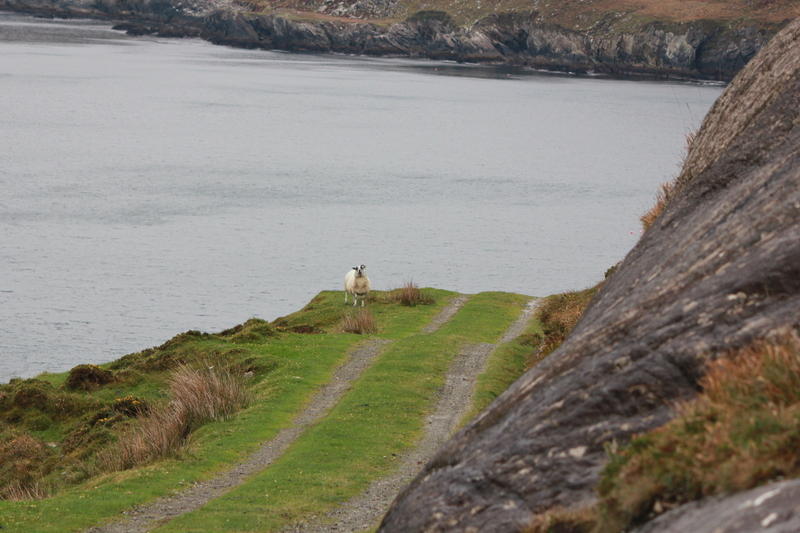 The house is at the end of the road on the side of the Cod’s Head peninsula, a rocky point on this rocky peninsula just north of Allihies. John mentioned it might not be a good road if one was afraid of heights. As in, sheer drop off past the tire track. A gentle rain fell as I drove up the increasingly steep and rocky road, through two gates, past sheep, then down a long incline and I did doubt whether this was a wise move. But there was nowhere to turn around, so I pressed on. I stopped before the final climb, where the road was muddier and grass covered, and turned around in a dime-sized spot. The house was now surrounded by several small, newer cottages, but there was no one around. The views were incredible from this lonely vantage point, looking north and west along the peninsula and out to sea, the twin skellings in the misty distance. The old house was in bad repair, and as I looked in the windows at the mold climbing the walls and the ceiling caving in from the leaking roof, I was cured of my desire for an Irish “fixer upper.” I think I would prefer central heating and insulated windows. And electricity would be nice. And maybe neighbors within five miles. As I looked out over the view a car slowly crawled up the road below me, and stopped at a seaside cottage tucked in a tiny cove. Good, I thought, if I get stuck they can tow me out. And I did have my cell phone, outfitted with an Irish sim card so I could make local calls. This road will NOT be on the tour. Going back up the steep, grass-covered road I needed to drive fast enough to keep the tires from slipping, but slow enough to stay on the road. Fine line there, but obviously I survived. After that the narrow main roads were a piece of cake. 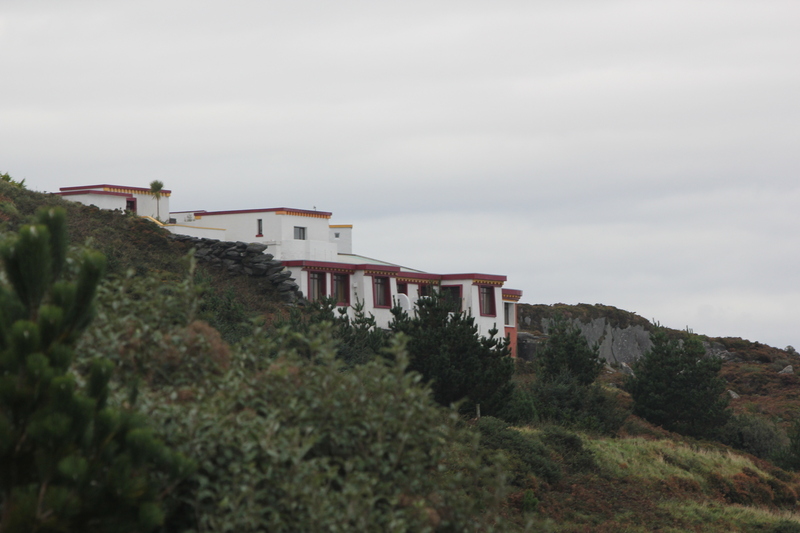 Dzogchen Beara, the only Buddhist retreat center in Ireland. Another highlight of the day was a stop at the Dzogchen Beara, a Tibetan Buddhist retreat center, built virtually into the cliffs on the west side of the peninsula. The parking lot was packed with cars, from dented VWs to a Mercedes, and I learned it was a big week for the center – Tibetan monk His Eminence Garchen Rinpoche was making his first appearance in Ireland. I wasn’t able to check out the meditation room, with again, killer views, but the tea shop was open. There I had tea with two men from Cork, who would have looked more at home at a hurling match than a Buddhist retreat. But both had been coming to the center for years, and said it really helped them cope with daily life. It was my second chat over tea that day, as earlier I had paid a visit to a man I met in O’Neill’s pub in Allihies, a character who goes by the name “Mighty.” My first night here he invited me to his home, and said when I was in the area, near the Dursey cable car, to just ask for him. Sure enough, a local B&B owner directed me to his house. Sitting in his little cottage overlooking Garinish Island, with books by Noam Chomsky and Annie Proulx littering his table, he expounded on politics and American Imperialism, while offering me locally made cheese and his mother’s brown bread. He pointed to a lovely pink stone cottage across the road and explained that the farm there had been his, but he had to sell it when he divorced his English wife, whom he called “the war office.” You just never know who you’re going to meet here. Today I’m meeting with the head of the Beara Historical Society, Connie Murphy, who has agreed to be my tour guide for a day when I bring groups in May. He’s a retired schoolteacher and knows the area inside out. Should be fun!